This amazing Striped Velvet Handbag is one of several great quality LuLu Dharma trendy handbags that will carry not only your items, but can be matched to your outfit! 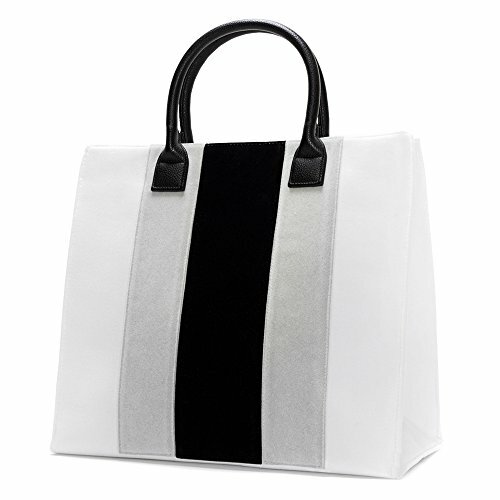 HANDBAG STYLE DETAILS - MATERIAL: Velvet and PU Leather Tote Bag - HARDWARE: Side Snaps and Magnetic Closures - SIZE: 16" W x 18" H x 6" D - STRAP: Strong PU Leather - This amazing bag has super modern and bold velvet racing stripes to make any outfit a standout! A totally unique and modern design, set to become a classic staple in any women's accessory closet. STRIPED HANDBAG FOR WOMEN - Are you in the market for a trendy, great quality handbag? Picking the right handbag for your needs is essential, and it can be frustrating when you can't find a bag that lines up exactly with what you need. If you want an everyday bag, that is big enough for your needs and comfortable to carry around then this is the bag for you! Take this bag with you to work, or use it for school and you will have plenty of room to carry everything you need and still look stylish! PURSE FOR WOMEN - Let these lovely purses become a go to life bag for you! Instead of carrying around several bags for each area of your life, you can use this one for all of life's necessities. These bags can be the perfect play bag for your kids, a work bag to carry your laptop and paperwork in, a nice school bag to carry your books, as well as an overnight bag you can take anywhere you need to hurry off to. Make this great quality Lulu Dharma bag your favorite go to bag for all your needs! TOTE BAG FOR WOMEN - This classic style handbag makes the perfect bag to use as an everyday tote bag. You can keep this bag as your go to errand bag and keep all of your mandatory essentials for running around and paying bills and picking up kids. This bag also makes a great bag to take with you on a trip to the beach, or even just out on the town for a day trip and you will now that you have enough room to store your kids sweaters, and snacks or anything else that you pick up along the way.